The Benjamin T. Rome School of Music, Drama, and Art has a tradition of excellence in the field of musicology. We combine the great wealth of research into the historical and cultural background of music traditionally associated with the discipline with an openness to the many newer trends in musicology and related fields such as music theory, aesthetics, ethnomusicology, cultural history, and the like. Our students benefit from our uniquely important location with our host of nearby research institutions and our many guest scholars. While our program has been recognized for distinct strengths in certain areas (including chant and the liturgical traditions of the Catholic Church, sacred music, opera, and Latin American music), we urge our students to gain wide knowledge of all areas of music, not just the so-called “mainstream” greats of western music. Click here for a list of recent dissertation and thesis topics by our students. Our weekly musicology colloquium meetings attract scholars in various fields who give presentations to the 15 to 20 undergraduate and graduate students enrolled in musicology programs each academic year. By hearing state-of-the-art research and interacting with the guest speakers, students receive a unique opportunity to build their own research, to be inspired by some of the great scholars active today, and to grow as researchers. Click here for the current Colloquium schedule as well as an archive of past speakers. 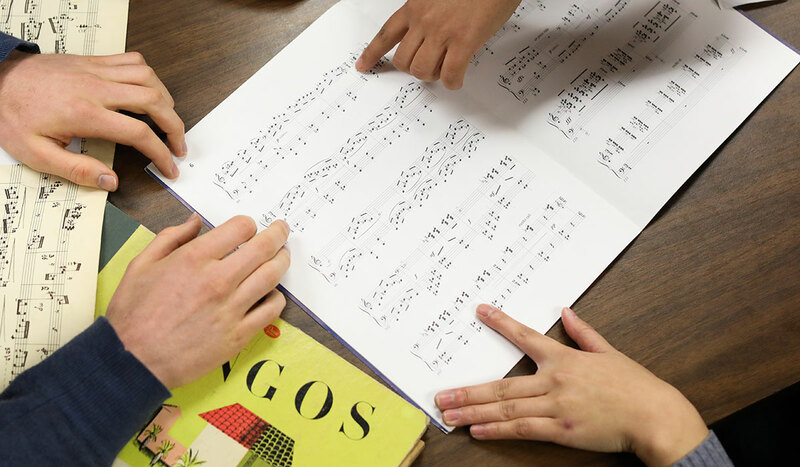 While the students in the musicology program constitute a distinct community within the School of Music, they are also integrated into the larger community of the School. Students from all academic area are welcome to take musicology courses, which adds a valuable dimension to class meetings. Musicology students have the opportunity to participate in performing ensembles and have also performed roles in opera productions at the School of Music. The Musicology Academic Area frequently collaborates with the CUA Opera Theatre to help present historically informed performances of earlier repertory, including Handel’s Giulio Cesare in Egitto and Monteverdi’s L’incoronazione di Poppea. The Spring 2009 production of Poppea represented a true collaboration between Musicology and Vocal Performance, in which a musicology course taught by Dr. Andrew H. Weaver was directly connected to the production and affected what occurred on stage. We offer a wide variety of courses, which are offered in rotation. Our course offerings range from broad surveys of periods and genres (including "History of Sacred Music" and "History of Opera") to focused seminars on specific topics. Recent seminar topics have included Schumann's Lieder, 20th-Century American Experimental Composers, Mozart's operas, the Romantic song cycle, the early Requiem, sacred music at the Habsburg court in the seventeenth century, the operas of Berg, analytical approaches to Stravinsky’s music, the history of music theory, and the history of jazz through analysis. Click here for a full list of the course offerings in musicology as well as a list of recent seminar topics. Our students' research opportunities are magnified by CUA's location. We coordinate closely with professional colleagues in DC-area institutions, including the Library of Congress, the Folger Shakespeare Library, the National Archives, the Holocaust Memorial Museum, and the archives of various performing organizations such as the Washington National Opera to provide unique research opportunities for our students. CUA offers internships (for credit) for work in cataloging projects in the Library of Congress, a program that can be tailored to students’ interests and thus be the foundation for research on a thesis or dissertation topic, offering unique access to uncatalogued materials in the Library’s Music Academic Area. Similar internships with other institutions can be arranged on a case-by-case basis. Many graduate classes include presentations by Library of Congress staff members of rare materials related to that course. The world of musical performance and study has changed greatly in the last thirty years, and musicology during this time has expanded to include many topics and a wide variety of research techniques that all students must explore. We at CUA encourage all our students to be well versed in all areas of music scholarship and to become leaders in explaining the fundamental role of music in our lives. With all of the excitement happening at the School of Music, we hope that you will join us on your path toward a career as a 21st-century music scholar. 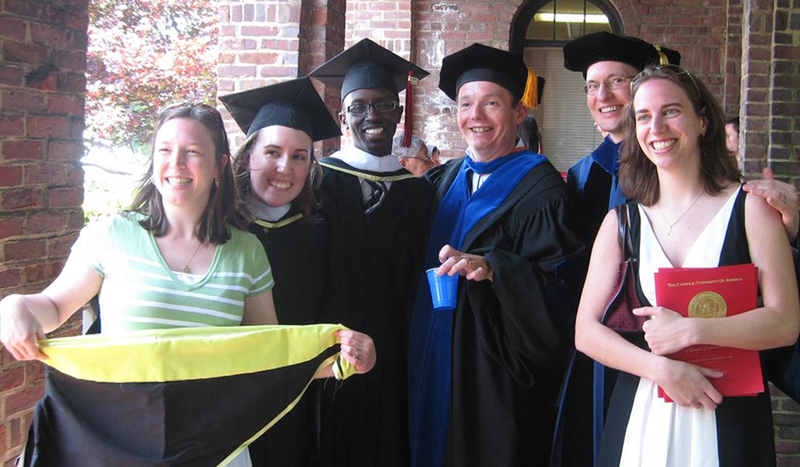 The CUA Musicology Academic Area is a vibrant community of students and faculty. Click here for profiles of our faculty. The heart of the Musicology Academic Area is the slate of courses we offer every semester. Click here for information about the musicology courses offered at the School of Music. There are also a number of other events throughout the year. Click here for information about upcoming musicological events. Members of the CUA musicology community also present at conferences, publish books and articles, and win grants and awards. Click here for news about our students, faculty, and alumni.